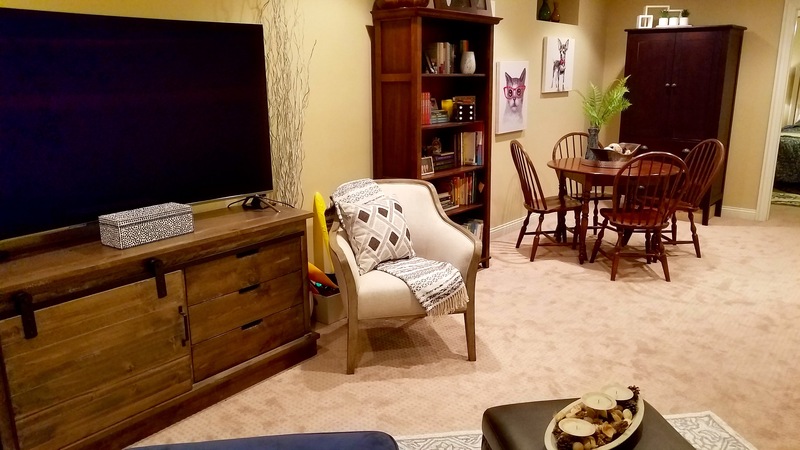 CATCH ALL TO BE ALL BASEMENT - Decor Designs, Inc.
We all have those overlooked and under appreciated spaces in our homes. 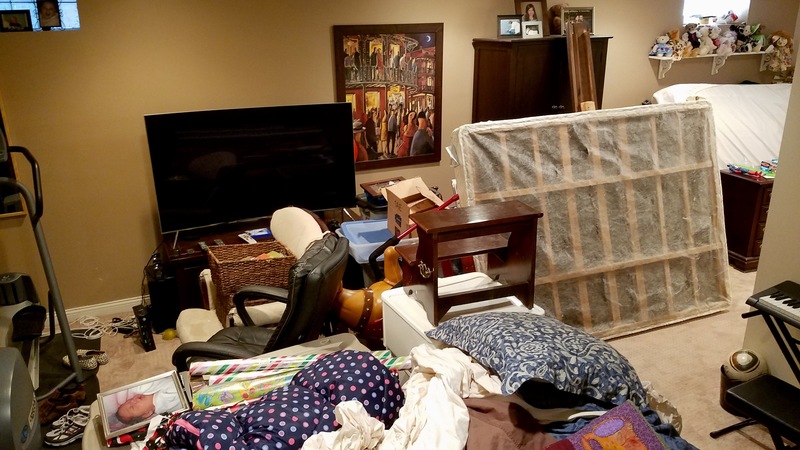 Usually, they’re the out-of-sight, out-of-mind rooms that could really use some attention but somehow stay on our to-do list for months or even years. This week, we had fun wrapping up a redesign project that included two of these often-overlooked spaces: a guest bedroom and finished basement. Our clients, a busy family of five including three children, called us before the holidays to take a look at their beautiful, single-family home in Chicago’s West Town neighborhood. The first floor of the home, dating back to the late 1800s, had already been renovated including a stylish, modern kitchen, dining room and living room with stacked stone fireplace. 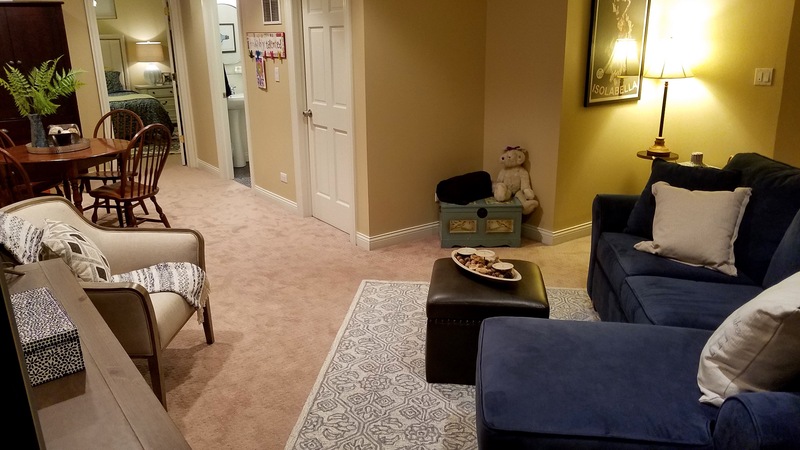 For this project, however, we were asked to turn our attention to the finished basement area including updating and styling a guest bedroom and bath. Our task was fairly straightforward. Create a multi-functional space that could serve the entire family’s needs. From a kid-friendly space to an adult hangout to a guest bedroom & bath, the family wanted help making the most of this under-utilized space. 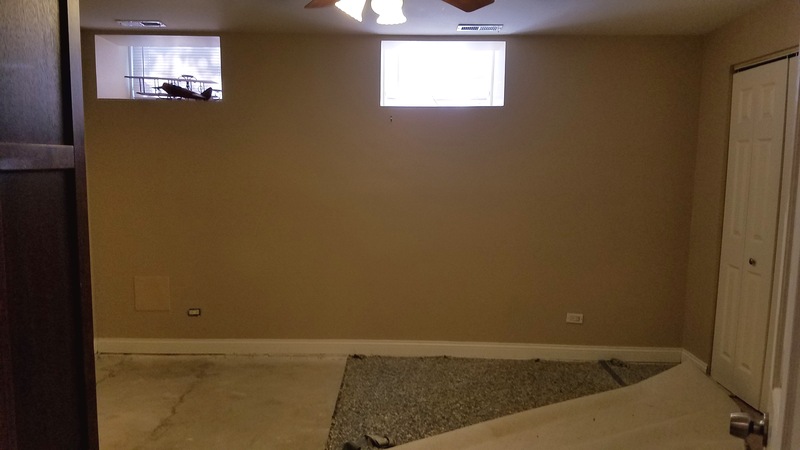 The homeowners, who’d already tackled a basement leak and carpet repair (see Befores) took the opportunity to purge and paint as well, leaving us a clean and decluttered canvas to work our magic. 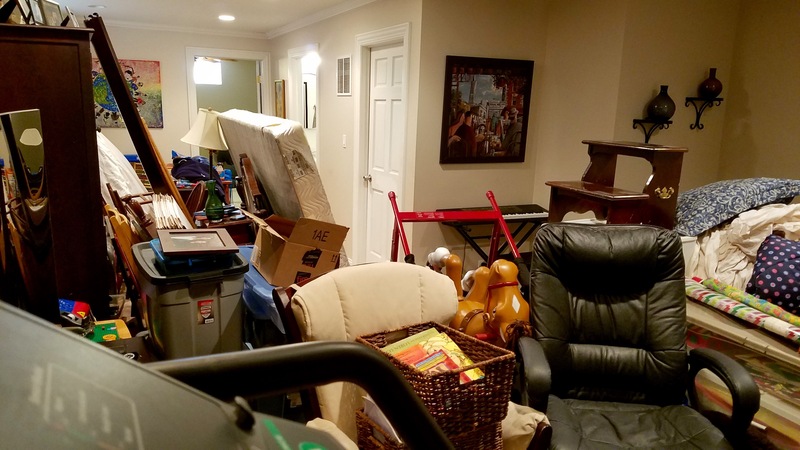 Since furniture is the single largest expense with any update, we repurposed as much of the homeowner’s existing furniture as possible saving money for the items we had to buy or replace. 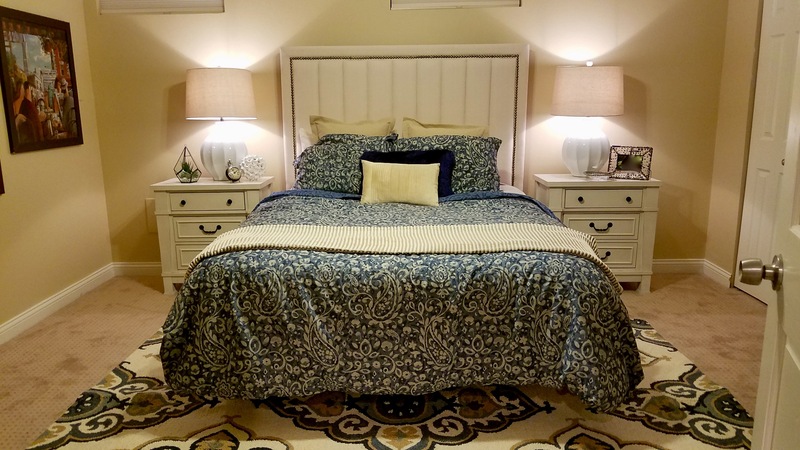 In the bedroom, a new upholstered headboard, off-white nightstands along with new blinds, an area rug, lamps, pillows and accessories were added creating a restful retreat for the grandparents or other overnight guests. The adjoining guest bathroom that had already been remodeled with stunning, cobalt-blue mosaic tile gave us our accent color inspiration for the entire basement. We added deep blue accents throughout which paired perfectly with the earthy gold on the walls creating the perfect contrast in the basement space. 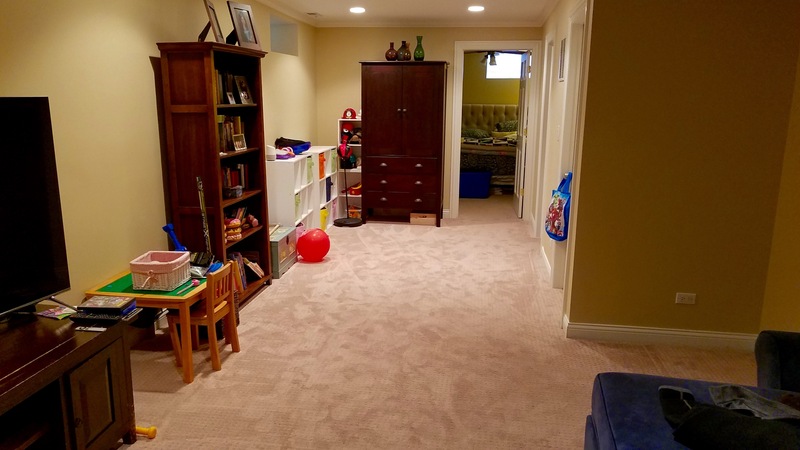 As is often the case with finished basements, the lack of natural light can make them feel dreary and claustrophobic. By using warm, rich colors paired with lighter rugs, colorful artwork and accessories in these spaces, we helped create a cozy, more inviting feel. 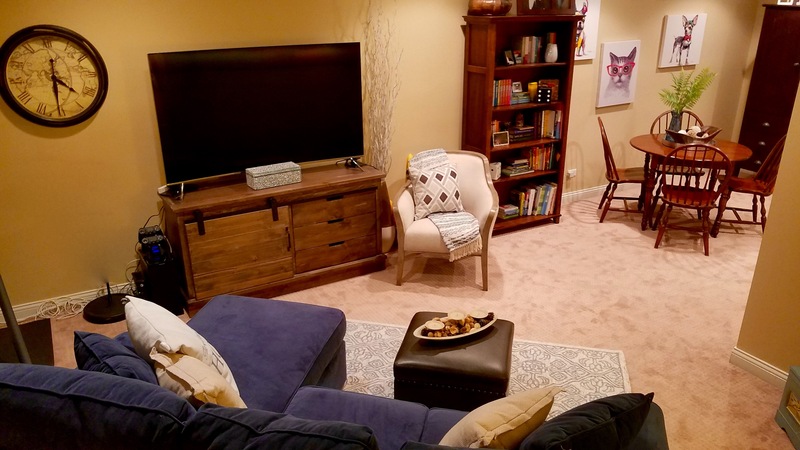 In the rest of the basement, we created two zones the family could adapt as needed. We created a seating area using their existing blue micro-suede sofa. With the sofa we added a new area rug, leather ottoman, entertainment console and accent chair. Nearby, a repurposed dining table is perfect for games and parties. And, a repurposed bookcase and entertainment console provided much needed storage for books, board games and all the things the family will re-accumulate over time. From oldest to youngest, the end result was a space that the family loved and couldn’t wait to share with friends and family. What spaces in your home are you under appreciating? If you need help visualizing these spaces or pulling them together, call or click today! We’d be happy to help! This entry was posted in Interior Decorating, Interior Redesign, Redesign on February 2, 2018 by Jeff Rice.